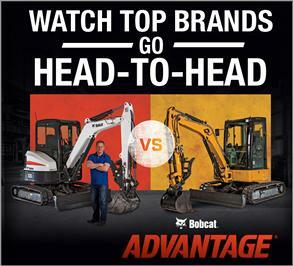 Not all excavators are equal. If you need proven performance, more comfort options and better design to maximize your uptime, there’s a revolutionary new lineup of Bobcat® machines that demands a look. 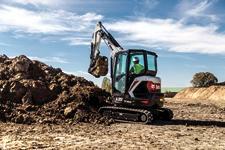 R-Series compact excavators have a bold new look that stands out, but it only hints at the enhanced performance, productivity and comfort beneath the surface. 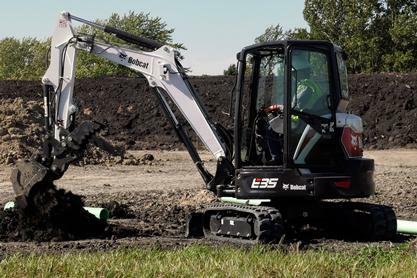 Part of the R-Series, the Bobcat® E32 compact (mini) excavator packs powerful performance and maneuverability into a conventional tail swing design. 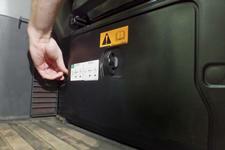 Narrower than the E35, this machine is ideal if you frequently work around width restrictions such as doors or gates. 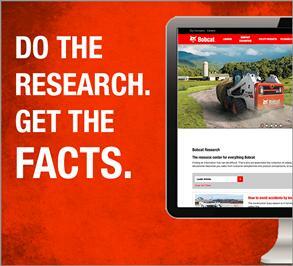 Boost your digging performance with the long arm option or a clamp-ready extendable arm option. 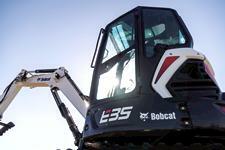 Part of the R-Series, the Bobcat® E35 compact (mini) excavator is a popular choice in the 3-ton size class. Zero Tail Swing (ZTS) provides unrestricted rotation, greater flexibility and reduced potential for damage to the machine and surrounding property. It’s available with an angle blade option, long arm option or clamp-ready extendable arm option. 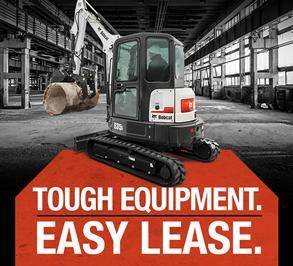 Upgrade to an optional 33 hp engine for even more productivity. As the largest excavator in the R-Series lineup, the minimal tail swing E85 excavator has class-leading digging capacity and depth. 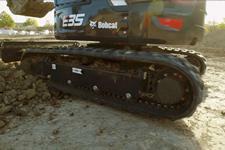 Speed up your attachment changes with the optional hydraulic pin grabber attachment system. 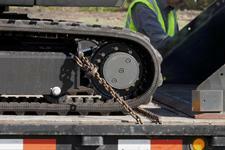 Other options include segmented tracks, add-on counterweight, and the depth check system. By integrating the rear counterweight into the machine, lift-over-side performance increased by up to 15 percent on select models. With a redesigned undercarriage, you can lift bigger loads and increase your productivity. Experience a ride quality that’s smoother, more stable and more comfortable than ever before. When you step inside the R-Series cab, you’ll see refinements everywhere you look. A larger suspension seat, better joystick material, foldable foot pedals and nearly 30 percent more floor space will keep you working comfortably all day long. You’ll see your work better than ever with windows that surround your operator station. R-Series excavators have 15 percent more glass surface area, including an improved top window and narrower side pillars that provide better visibility. Set your temperature and forget it. With climate control, your machine automatically adjusts the heat/air-conditioning and airflow to keep you comfortable, freeing you up to focus on your work. 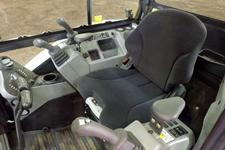 An optional heated seat provides added comfort while working in cold temperatures. 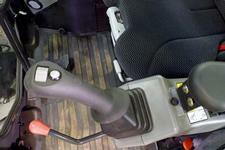 Inside the R-Series cab, you’ll experience reduced vibration. 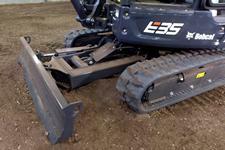 Many features contribute to the improvement, including a dual-flange track roller system, a tighter connection between body panels and robust hinges and latches. Sign up to receive additional product updates. With some models, you can adjust your angle blade to the ideal position for your work with 33 percent more downward motion. A full 12 degrees of range helps you stabilize your excavator when digging on an uneven surface or trenching at an angle. 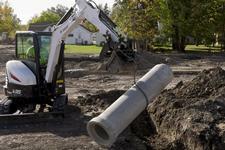 Prepare your excavator for transport with more easy-access tie-down points. Straightforward trailering means you can get to your next jobsite faster and back to work sooner. A second auxiliary thumb toggle lets you switch between the second auxiliary and the boom-offset without letting go of the joystick. You don’t have to stop what you are doing to search for the switch as it is located at your fingertips on the left joystick. Access to the pattern control selector is easier than ever. The new location lets you choose between ISO and Standard patterns without leaving the operator’s seat.